• The Pirates switched to Frank Fredrickson to assume coaching duties in 1929-30 and switched to black and orange uniforms for their fifth – and final season. • The Pirates achieved their worst win-loss record with -5 wins, 36 losses, and 3 ties in 44 games. • With the stock market crash of 1929, followed by the Great Depression, the city’s steel industry was hurting and the Pirates owners found themselves $400,000 in debt and in need to replace the aging Duquesne Gardens. • The Pirates had managed only 13 points and on October 18, 1930 at the NHL Governors meeting, Leonard moved the team across the Keystone State to become the Philadelphia Quakers for the franchise’s last season in 1930-31. * = Fredrickson was released by Philadelphia two days later. September, 1929 – Duke McCurry Traded to Montreal Maroons by Pittsburgh for cash. October 8, 1929 – Archie Briden was traded to Pittsburgh by the Philadelphia Arrows (Can-Am) for cash. October 22, 1929 – Albert Holway traded to London Panthers (IHL) by Pittsburgh for cash. October 31, 1929 – James Jarvis signed as a free agent by Pittsburgh. December 23, 1929 – Gord Fraser traded to Pittsburgh by Montreal Canadiens for Bert McCaffery. January 18, 1930 – Andrew “Red” Spooner loaned to Pittsburgh by Fort William Forts (TBSHL) to replace injured Joe Miller. January 27, 1930 – Archie Briden was traded to the London Panthers (IHL) by Pittsburgh for cash. Pittsburgh’s hopes for a National Hockey League berth next season have grown as cold as a mother-in-law’s kiss. With Leonard’s claim of a new Pittsburgh arena in 1929 unfulfilled, the Duquesne Garden got the green light for operating as a hockey arena in 1929-30 and was scheduled to open on October 28, 10 days later than originally planned. But on October 31, the Pirates’ training was relocated to Fort Erie, Ontario. The ice at the ancient Garden was still not ready. Fredrickson and his team spent the next two weeks training on the ice surfaces of Fort Erie and Hamilton. The Press reported on November 1 that minor repairs had to be made to the Garden’s “freezing equipment,” but that the arena’s “glassy surface” would be spread out in the next few days. Pittsburgh’s poor finish the previous year induced the team to make player moves. The talk in Pittsburgh hockey circles in November 1929 centered on Cliff Barton and Jim Jarvis, two young forwards acquired from Port Arthur Ports, winners of the Allan Cup in 1928-29. Bert Taggart of the Post-Gazette called the pair “two of the best looking prospects to come out of the Dominion.” Barton, a 22-year-old right winger, had scored 10 goals and 8 assists in 10 games for the amateur champion Ports, but his stats with the Pirates would be a more modest 4 goals and 2 assists in 39 games. Jarvis, a 21-year-old left wing, had scored 13 goals and 5 assists in 17 games with Port Arthur. With Pittsburgh, he would score 11 goals and 8 assists in 44 games. The playing careers of Barton and Jarvis would continue until the mid-1940s, but their times in the NHL would be very brief. The Pirates tried to trade Hib Milks to Ottawa for left wing Hector “Hurricane” Kilrea, but the Senators did not go for it. The Pirates rejected offers from the Maple Leafs and Rangers for Milks and Darragh as a pair. The Post-Gazette reported the Rangers offered as much as $35,000 for the Milks-Darragh duo, and Toronto offered $25,000 and defenseman Eric Pettinger (who was just a part of what the Leafs would trade to Ottawa for famed defenseman King Clancy the following year). Bert Taggart wrote in the Post-Gazette that Milks and Darragh were playing the best hockey of their careers and “to take them away would be just about as fateful as taking a rudder off a ship.” Fredrickson told the Post-Gazette, “It is not money that we want. It is material.” He avowed a “trades, not sales” policy. Nevertheless, Pittsburgh had just sold two players off and would soon sell a third. Left wing Duke McCurry, who had played in Pittsburgh since 1923 but had one assist in 35 games during 1928-29, had been traded to the Montreal Maroons for cash in late September 1929 but refused to report. He sat out 1929-30 and would end his hockey career with the Pittsburgh Yellow Jackets in 1930-31. Defenseman “Toots” Holway was loaned to the London (Ontario) Panthers shortly before the 1929-30 season began, also for cash. In October 1929, the Pirates picked up veteran left wing Archie Briden, who had played the previous two seasons for the CAHL Philadelphia Arrows. Briden’s point output for Pittsburgh fell to half of what it had been for Philadelphia, and the Post-Gazette reported he had “slowed up considerably” and couldn’t “stand the guff of the major style of play.” Fredrickson, said to be unimpressed with Briden for some time, would sell him to the IHL London Panthers for cash in late January 1930. Tex White returned to Pittsburgh at right wing. He had been loaned to the Americans late the previous season for defenseman Jesse Spring and the loan of left wing Edmond Bouchard, who would now go to the CAHL New Haven Eagles. Spring, who had also played for Pittsburgh in 1925-26 before leaving for short stays with Toronto and the Americans, now returned to the Americans. This stay in New York would also prove to be short. Spring appeared in newspaper lineups for the first three Americans games, but apparently not on the ice (his statistics for this New York stint do not appear in the records). Then, his whereabouts were unknown until New Year’s Day, 1930, when he was back in Pittsburgh as a Pirate once last time. Significant changes in the NHL’s offsides rules were another unknown in the mix. The severe league-wide scoring drought in 1928-29 induced the NHL to allow forward passing in the offensive zone. It had previously been restricted to the defensive and neutral zones. The much-relaxed rules now allowed attacking players to precede the puck into the offensive zone. A tremendous upsurge in scoring was the initial result. Attacking players would park in front of the opposing net, waiting for a teammate’s long pass. Just weeks after the stock market crash of October 1929 that ushered in the Great Depression, the Pirates opened the 1929-30 season at home versus the Montreal Maroons. Fans were treated to another uniform change: the Pirates wore eye-catching orange, black, and white jerseys designed in unique patterns. Taggart observed that the new offsides rules tended to confuse the local players, who “confined their play to the old style.” The Maroons took the game, 5-2, and Taggart remarked that the Pirates needed to “polish up a little on their shooting.” Pittsburgh did that in their next match, a home game with Toronto. After the Maple Leafs took a 2-1 lead in the second period, the Pirates answered with nine straight goals on their way to a 10-5 win. Defenseman John McKinnon scored four of the Pittsburgh goals. Taggart noted that it was one of the most pleasant evenings Pirate fans had seen in a long time. But the new NHL rules then appeared to work against the Pirates. Losses of 5-3, 9-2, and 6-2 to the Rangers, Canadiens, and Bruins came as November ended. Attendance was quickly an issue. The Pittsburgh Press noted that only 2,500 fans appeared at the Duquesne Garden for the Rangers game. Four losses opened December until the Pirates defeated the Americans 8-1 on December 14 in Pittsburgh. The win came even though Drury (broken hand) and Fredrickson (damaged knee ligaments) were both on the sidelines. And the victory was costly. Smith received two cracked ribs and a head injury, and McCaffrey suffered a cut ear and bruised leg. Early-season aliments had also hampered Lowrey (slowly recovering from a sprained ankle) and Darragh (the flu, followed by three cracked ribs and a facial infection). McKinnon was also out briefly in mid-December (wrenched ankle). Younger players like Jarvis and Barton filled the breach, but Pittsburgh’s most experienced hands were out of action or not 100 percent. Drury’s hand injury would bother him all season (and keep him completely out of action from November 30 until January 11), and coach Fredrickson would sit the rest of the season out as a player following knee surgery. The Pirates took part in history in their next game. The Blackhawks had already played several home games at the Chicago Coliseum in 1929-30, but they skated at the new Chicago Stadium for the first time on December 15 versus Pittsburgh. It was a happy night in the Windy City. Before 14,000 fans, Chicago, much improved over the previous year, skated off with a 3-1 win over the Pirates and a 7-2-2 record. Meanwhile, 2-9-0 Pittsburgh headed back home to face the Canadiens on December 17 for their third game in four nights. The Pirates would have to adjust immediately to a significantly changed game of hockey. The NHL moved very quickly to reduce the bombardment on the league’s goalies the new offsides rules had wrought. Relief for Joe Miller and all other NHL goalies came on December 16, a mere month after the start of the season. The league at that point required the puck to precede the attacking players into the attack zone. In doing so, the NHL took a giant step toward the offsides rules known today. Fredrickson, however, appeared to cling to the much looser rules enacted at the season’s start. He discussed the rule changes intensely with Conn Smythe at the NHL meeting where the revisions were announced. Fredrickson held that the changes would greatly alter the style of attack but not reduce the number of goals scored. But the changes reduced the goal barrage. Smythe had derided the game under the looser rules as “not hockey, but lacrosse.” Now the sport was well on its way to becoming modern hockey. Still, some hockey officials criticized the NHL for changing the rule in a highly unusual mid-season move. It was said that players who had been coached to take advantage of one set of rules now were being forced to make quick revisions on the fly, rather than more gradually at the start of a new season. After that deal, things looked up for the Pirates for just a moment. Pittsburgh’s blue line saw improvement over the next three games, in which Pittsburgh surrendered only five goals. The Pirates managed to defeat Detroit, 3-1, in a December 26 match at the Duquesne Garden, even though Milks could not play because he was ill with a severe cold. It was the first game Milks had missed in 15 years as a player. McCaffrey played for the Pirates in the game with the Cougars before leaving for Montreal. The Pirates then faced the Americans in New York on December 29 in a battle of division tail-enders. The Americans came out on top, 3-2, with Milks still sidelined. Pittsburgh opened 1930 with a New Year’s Day deal with the Americans that returned Jesse Spring to the Pittsburgh defense. (The Pittsburgh Post-Gazette said Fredrickson knew nothing about the deal until Spring reported. Some observers must have been reminded of management practices that perturbed Odie Cleghorn.) The next day, the Pirates notched a 3-1 home win against the fading Ottawa Senators, by now at the back of the playoff-bound herd instead of league leaders. “SMASHING ATTACK IN SECOND PERIOD TUMBLES VISITORS,” the Post-Gazette headline proclaimed. (This attack was reduced to a “spasmodic spurt” in the actual story.) Fredrickson and Milks returned (though in Fredrickson’s case strictly as a coach, and with Milks, still feeling the effects of his illness). The Pirates at this point stood at 4-12-1 in the American Division cellar. Pittsburgh had a 4-4-1 record at home, not to mention a surprising 3-0-1 run in their last four home games. The Ottawa Citizen heralded Spring and Fraser for reinforcing the highly unsteady Pirate defense. The Post-Gazette said the Pirates play at home in that 3-0-1 stretch “left nothing to be desired.” In fact, Pittsburgh had outscored the opposition by a 17-to-6 margin in those four games. But it was a high-water mark. The “crippled and much-abused” Pirates (the Post-Gazette‘s term) had also lost eight straight on the road. And their season would only go downhill from there. An 8-3 road loss to the Rangers started off an eight-game Pirate losing streak. Home losses to the Bruins (4-3) and Americans (3-1) came next. The 3-1 loss was the Americans’ first road win of the season. Five more consecutive defeats ensued. The Post-Gazette attributed the slump to “sundry injuries” to the team’s better players. The Pirates then managed to break their string of 12 straight road losses for the season (and 20 straight dating back into 1928-29) when they tied the Americans, 1-1, in New York on January 26. The deadlock marked the first of only two ties on enemy ice the Pirates enjoyed in 1929-30 (to go with 22 losses and no wins). Archie Briden’s third-period tying goal averted yet another Pittsburgh defeat. Miller’s stellar goaltending held off the Americans’ frequent scoring chances in overtime. One game played during the January losing spell bears special mention. On January 18, 20-year-old goalie Andrew “Red” Spooner, on loan from the Fort William Forts, substituted for an ailing Joe Miller in a game against the visiting Rangers. Miller was slowed by an infected foot. Fredrickson reshuffled the lineups for this game. Milks was moved back to defense. Spooner had what the Post-Gazette said was “quite a reputation” with Fort William. On Duquesne Garden ice, however, Spooner let in four goals in the second period, at least three of which were gifts to the New Yorkers. The first, Al Clark of the Press said, was “an easy shot, but Spooner failed to even make a presentable try.” The Post-Gazette said Spooner looked “bewildered on a couple of occasions.” Miller came in for Spooner for the third period with the Pirates trailing, 4-3. Pittsburgh soon grabbed a 5-4 lead, but two Rangers goals then got past Miller. Pittsburgh took a 6-5 loss. Spooner would appear at the Philadelphia Quaker training camp the following season, but his two periods on this night represented his entire NHL career. January 25, 1930; The Pirates (left) and Chicago Blackhawks pose after playing a game in Atlantic City, NJ. The Pirates were the “home” team and lost to Chicago, 5-2. Pittsburgh would manage only one more win in their last 19 games before folding. “Except for the loss of morale that accompanies slumps, the Pirates appear to be in pretty good shape,” the Post-Gazette reported on February 1. The writer hoped the Pirates could emerge from a 1-9-1 January and defeat an “almost equally demoralized” Detroit Cougar team that night at the Duquesne Garden. The Cougars, sporting an 11-14-3 record, had won on the road only three times all season. As a result, they were rooted to fourth place in the American Division, always just short of a playoff spot. On the night of February 1, it was the Pirates who rose above the malaise. A crowd that the Press put at 4,000 witnessed what became the final victory in Pirate history. Pittsburgh beat Detroit, 3-2, on Lowrey’s third-period goal. The Post-Gazette stated two days later, “If the Pirates could play all their games on home ice, they would have little trouble getting into the play-offs.” The Pirates’ home record after the Detroit victory was 5-8-1. Even if math didn’t support the Post-Gazette claim, in the season’s first half the Pirates were capable of winning at home but completely inept on the road (0-13-1 on February 1). But after the Detroit win, the Pirates were on the losing end just as much at home as on the road. Nine February losses in a row followed, and the Pirates entered March with an unenviable 5-30-2 record. On February 23, the Press announced that Fredrickson had “started the rebuilding of the Pirate hockey club.” Just back from a two-week tour of minor league teams, Fredrickson was starting yet another shakeup. He had signed five rookies and placed another rookie on a training list as well as another two on the negotiation list. But youth would not be served to the few remaining Duquesne Garden fans. Out of these eight players, none would make a quick jump to the NHL and play for the Pirates in the team’s last few weeks. One (a prized find, goalie Wilf Cude) would play for the Pirates’ successor, the 1930-31 Philadelphia Quakers. Cude last played in the NHL in 1941. Another, Bill MacKenzie, a defenseman touted as “another Eddie Shore,” was definitely not in the same class as the legendary Bruins defenseman. Still, MacKenzie played in the NHL for most of 1932 to 1940 for the Blackhawks, Maroons, Canadiens, and Rangers. The other six would not play in the NHL. Yet, a respectable two out of eight prospects would make the grade in time. Fredrickson’s tour paid off, though definitely not in enough time to do the Pirates any good. After the February 1 victory, the Pirates were on the losing end in 15 of their last 16 games. On average, the notoriously weak Pirate defense surrendered just over four goals per game in their last 16 contests. Offensively, Pittsburgh averaged under two goals per game in that stretch. The only interruption in the string of defeats came on March 13. The Pirates overcame a 2-0 deficit to tie a lethargic Canadiens team, 2-2, in Montreal. The tie broke the Pirates’ 13-game losing streak. After that, two Pirate relocated “home” game defeats laid 1929-30 and the Pirates’ five-year stay in Pittsburgh mercifully to rest. A 4-3 overtime loss to the Rangers on March 16 at Madison Square Garden was followed by a 4-2 loss to Detroit at Fort Erie, Ontario on March 18. Herb Drury scored the two Pirate goals in the Detroit game. His second goal gave Pittsburgh a 2-1 lead in the second period, but the Cougars scored three times in the third and the Pirates were history. “HOCKEY PIRATES DO USUAL STUNT,” the Pittsburgh Press headline read the morning after. Both the Press and Post-Gazette considered the game covered with two to three short sentences. 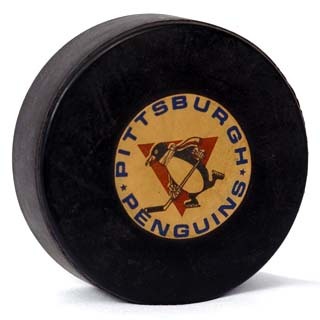 The final record of the Pirates in their final year was a 1929-30 NHL worst of 5-36-3. Pittsburgh finished a good 20 points in the standings behind the second-worst team, the New York Americans. The five-year record for the Pittsburgh Pirates stood at 68-124-24. The Pirates had scored 384 goals, and 531 had been scored against them. Under the Townsends, the Pirates had sailed at a 54-61-13 clip (at the Duquesne Garden, 31-27-5). With Leonard at the helm, the team’s overall record fell precipitously to 14-63-11. The final days in Pittsburgh had been nightmarish. The team’s already dismal attendance figures spiraled downward. As a result, seven out of the last 13 Pirate home games were played outside of Pittsburgh. (The Pirates, then, were the relocated-home-game leaders of the NHL in 1929-30. Ottawa’s Senators, not drawing well at the Ottawa Auditorium even though the team was headed for the playoffs, relocated five home games of their own.) On February 22, 1930, only 300 unenthusiastic fans attended a Pirates home game actually played at the Duquesne Garden, versus the Montreal Maroons. Not surprisingly, the Pirates were also a poor attraction on the road. On March 11, a crowd of only 3,000 showed up in Toronto to see the Maple Leafs down the Pirates, 3-2. It was the smallest attendance at a Maple Leaf home game in two years. The Pirates were receiving no particular financial help from the league. In February, the NHL had established the National Hockey League Joint Relief Fund. It was a special fund for clubs running deficits in which the NHL held one-seventh of the 3½ percent of the gate that visiting teams received. On approval of the Board of Governors, a team could draw from the fund an amount of up to 50 percent of its deficit. The Board had full power to audit an applicant’s operations and decide on the projected operating budget to determine the relief a club should get. Author John Chi-Kit Wong (Lords of the Rinks: The Emergence of the National Hockey League 1875-1936) noted that no club applied for fund money. To do so, the applicant team would have had to open its books to the scrutiny of other owners, reveal all too much about that team’s operations, and possibly lose competitive advantage. The net effect of the fund was that the one-seventh of 3½ percent of the gate remained with the NHL and out of the pockets of struggling teams such as Pittsburgh. According to game-receipt reports cited in Wong’s book, Detroit’s visitor’s share (3½ percent of net revenue) for 1929-30 was $5,366; for Ottawa, this figure was $3,396. If a rough average of $5,000 can be accepted (or a $50,000 total for the 10-team NHL), one-seventh of that figure would have yielded a fund total of just over $7,000 for that season. This is only a guess. However, several present-day sources say the Pirates were $400,000 in debt by this time. It is safe to say that even if the Pirates had applied for and received the fund’s entire amount, the team would not have been significantly helped. The Duquesne Garden’s continuing ghastly state only contributed to the Pirates’ misfortunes. The Garden simply had far too few seats to be profitable and virtually repelled hockey fans because it lacked comforts or conveniences. Leonard had called the Garden “too small and not modern enough.” But Pittsburgh’s proposed Town Hall was still going nowhere, even if a rink would be a part of it at all. Leonard had claimed in the fall of 1929 that he had the financial backing to build an arena that would seat 15,000 to 20,000 even if Town Hall were to fall through. No such arena was forthcoming. Ralph Davis of the Pittsburgh Press wrote that “Leonard and his crowd” wanted an assurance that there would be no Town Hall before “they dump their own money in a new place.” Davis said Leonard would have difficulty getting any such pledge. The Chicago choice did not come through, and it was likely just as well. The deal as reported in the Christian Science Monitor on September 29 was a complicated mixture. Major Frederic McLaughlin was willing to sell his Blackhawks to Chicago Stadium provided that he could stay active in the NHL and operate a second team in Chicago. To accomplish that, he would purchase the Pirates and move the team to Chicago with Stadium and NHL permission. All of this when McLaughlin had to contend with a conspiracy lawsuit from Eddie Livingstone, the former head of the AHA Chicago Cardinals. Livingstone charged that McLaughlin and two codefendants had attempted to destroy his business when he handled the Cardinals. The suit ended in mistrials. Further complicating the picture for the Pirates, the Blackhawks were on the rise in the standings The lackluster Pirates would only have been a weak second team in Chicago. A proposal to move the Ottawa Senators to Chicago also came to no end in 1931. The Press took these plans a few steps further. If a new International Hockey League team were to come to Pittsburgh, it would be used as a farm team for the Pirates when the Pirates made their return. Town Hall was expected to be built in two years, the Press said – the amount of time needed to build a team. In fact, the IHL came to the Duquesne Garden in 1930-31, taking to the ice as the new Yellow Jackets. The IHL promoted its play as a faster version of the NHL’s (what Callahan called a “sizzling brand” in opening negotiations with the Duquesne Garden to house the Jackets). As the Jackets prepared to play their first game in mid-November, Ralph Davis of the Press held to his contrary position on the Pirates. Davis wrote that the announcement that the NHL team had moved to Philadelphia “for at least a year – probably for good” had been received with “little regret.” He adopted a wait-and-see stance on whether the Yellow Jackets’ ability to deliver the goods to Pittsburgh’s fans, who, he said, understood hockey better than those in any other American city save Boston. Davis would be proved right about the Pirates’ non-return. The Town Hall project, burdened with constant delays and in-fighting, would never be built (although the final nail in the coffin would not come until January 1935). And not coincidentally, the final word that Pirates would not resume play in Pittsburgh came in May 1936.